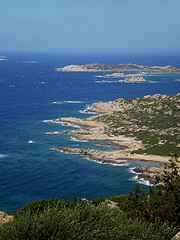 The Costa Smeralda is a precious coast stretched along the North-East area of Sardinia (Gallura). it is included in the municipality of Arzachena and it forms a peninsula extending from the Gulf of Arzachena to that of Cugnana. The Consorzio Costa Smeralda, born in 1962 through Ishmeelite Prince Karim Aga Khan, has given a major boost to the development of the tourist industry in Sardinia, so ithas become an important and popular resort area. The coastline stretches for about 88 kilometres, offering frequent bays, capes and numerous islands. 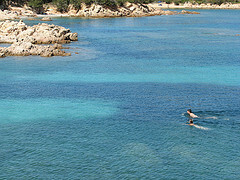 The Costa Smeralda is a veritable paradise on earth. Difficult to give advice, since everything is so fascinating that nothing seems to be forgottable. As a practical advice I really believe it is better to book before getting there. And, unless you are prepared to spend a lot of money, I suggest not to look for n accommodation in front of a beach. This is a luxury reserved for visitors of 5 star hotels or for the owners of luxury villas. Usually between the beach and the buildings there are at least 500 meters of pristine nature that provide a cool refreshment when the sun does not let up. 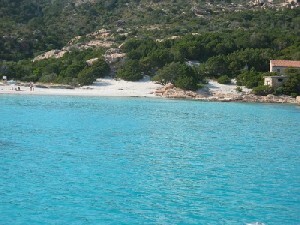 One of the must of the holiday will be the visit to Portorotondo and Porto Cervo. Beautiful during the days and rich and elegant at night. 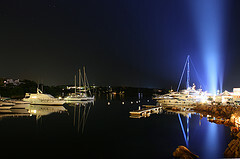 The two ports are surrounded by luxury yachts and in the narrow streets there is a perfect order s, despite the many tourists walking and the many bars and shops. Porto Cervo is immersed in the Mediterranean scrub and enjoys a breathtaking view over an emerald sea! Also important it is the excursion to the Island of La Maddalena: ribs with green and crystal clear waters appearing as an underwater paradise, more beautiful and more magical than in a fairy tale. Photos from the albums of: if you love me, www.scris.it, matteopenzo, mikilgenio80 and cristianocani.